Luxe Modz Collection brings you unique and stylish body jewelry. This septum clicker is made of high-quality surgical steel . Elegantly designed for any style of wear. 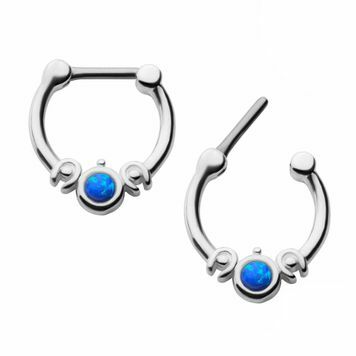 Its synthetic blue opal is the perfect compliment to the 1mm bar in 6.5 mm wearable length. Be Bold, Be Yourself and place your order today.